Sixteen candles! That's right our boy, Morty, is turning sixteen this year! He was adopted by the Bucks County SPCA in 2006 and after 13 years of service we think it's time for Morty to enjoy retirement. Morty will be spending the rest of his golden years relaxing in the home of one of our staff members. We wanted to let his adoring fans know that as of March, he will no longer be around our Lahaska shelter, but living it up in his new home! 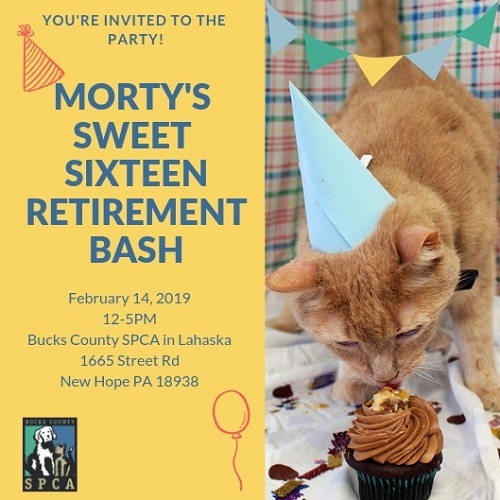 Come out and celebrate with us and give this amazing cat a wonderful send off into retirement! Can't come to our Valentine's day event? No worries! Morty will still be here until the end of February. We will have cake available as well as a raffle to win the last pair of Morty socks! Stop by 12-5PM at our Lahaska shelter on February 14th to get a picture and give a pat to your favorite orange cat! Looking to give Morty a birthday gift? Morty is asking for donations to his favorite shelter or check out our kitten wish list to help all the mini Morty's out there have a great start! We will be offering $16 adoption fees for all of our our senior cats. What better way to celebrate Morty than to invite a senior cat into your home!